It was a frosty 10 degrees on Monday morning and our schedule for the day included time in the outdoor classroom first period. I was a bit worried that the children would not be enthused about spending time in the chilly yard. For today’s lesson, I put together a special bin of magnifying glasses, mini clipboards, sticky notes and paper, crayons, and our class iPad. Before heading outside, I informed the children that today I had a question for them: “What do you notice in our Outdoor Classroom?” I showed them our special bin of tools for helping them with their noticing. Hands shot up when I asked who might require a magnifying glass. I distributed the materials to the students and we headed outdoors. (*I should mention that I only had about 6 magnifying glasses and 4 clipboards. I had enough paper and crayons for the whole class. In my experience, limiting materials encourages turn taking and sharing). Any worries I had about the children not being excited to be outdoors disappeared the minute we got outside. The children spread out all over the yard, crouching under bushes, turning over logs, and digging in the soil. Immediately they started recording their thinking and noticing on sticky notes and paper. 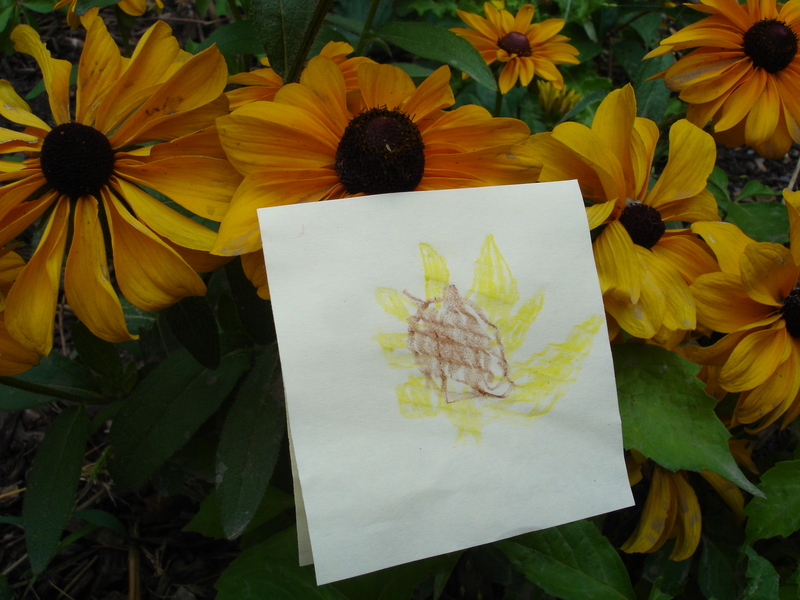 Some children used the sticky notes to label what they found – placing them on top of flowers and rocks and mushrooms. When the period was done, we gathered up our materials and headed inside for a sharing circle. Once again I reiterated today’s question: “What did you notice in the Outdoor Classroom?” Seeing as it is only the beginning of the year, I was surprised by the children’s ability to listen to each other’s findings and ask questions. They were truly interested to see and hear about what their classmates discovered. The discussion gradually began to focus on a handful of worms that a group of boys had collected and brought inside with them. We wrapped up our sharing time by deciding as a class that our worms needed further investigation at our classroom Science and Nature Centre. Stay tuned for the interesting discoveries that emerged from our extended worm exploration indoors! 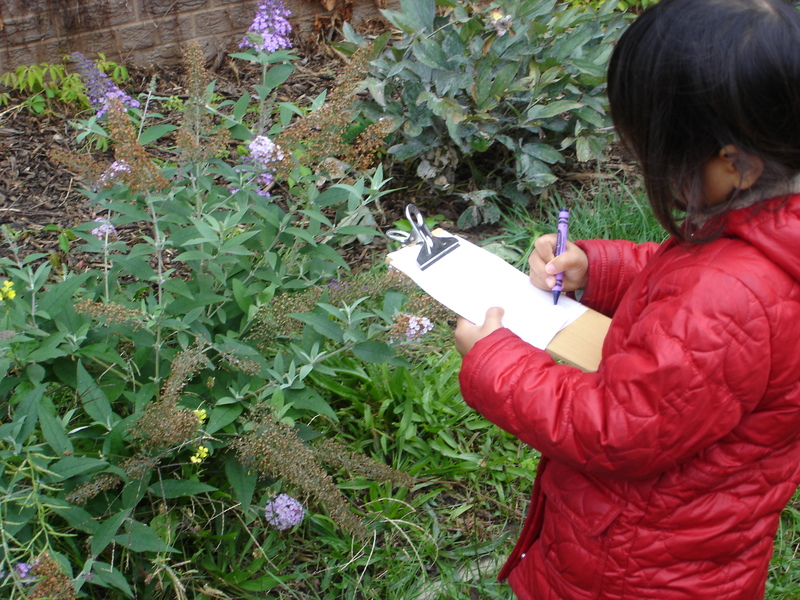 Does your school have an area for outdoor exploration? 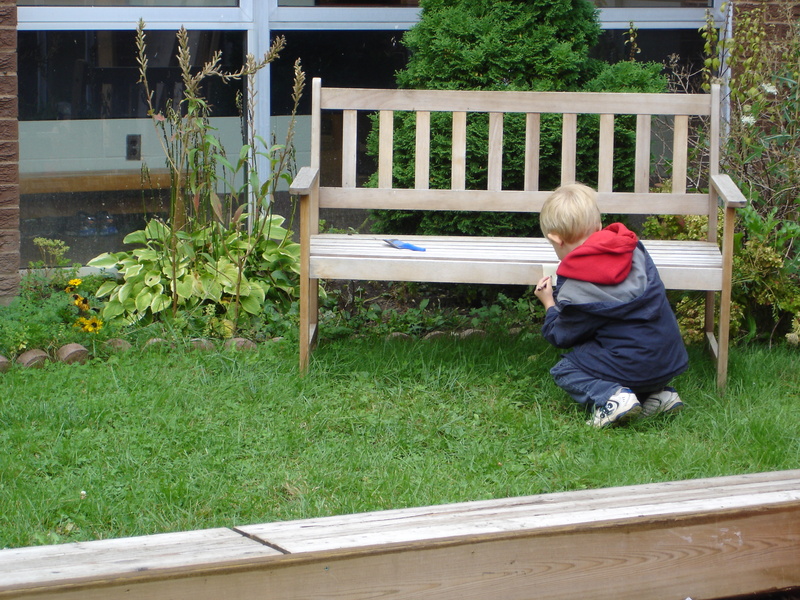 How do you use the outdoor environment to enhance your Kindergarten program? 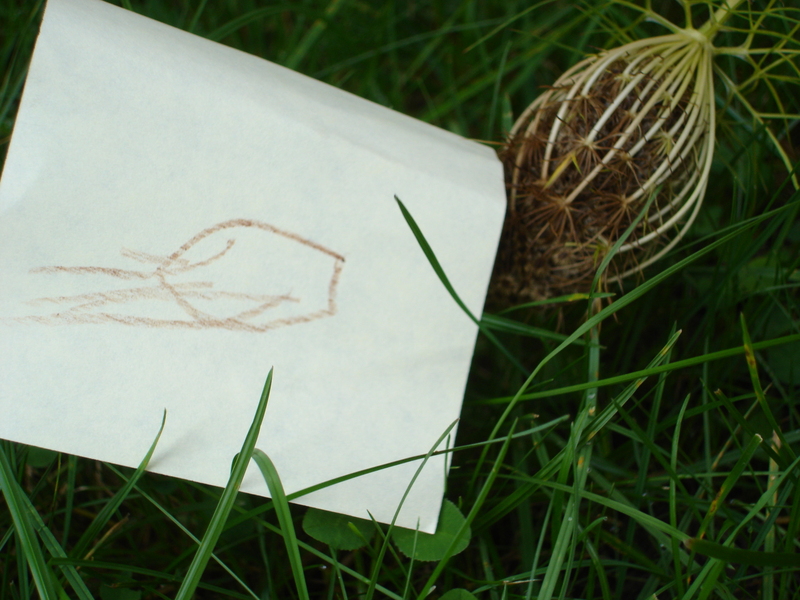 This entry was posted in Outdoor Classroom and tagged observations, outdoor classroom, science and nature by msmcdonell. Bookmark the permalink. Ms. McDonell, thank you for sharing such a wonderful teaching and learning experience that you had with your students! It is clear from the pictures in this post that the natural environment can really enhance the program.The use of the outdoor environment and the special tools you gathered, inspired and motivated your students to ask questions and pay deep attention to the outdoors. The way the children were able to document their learning experiences shows their deep engagement in this task. Enjoy your inquiry on worms! I am sure that the children have lots of questions that you are going to explore with them. This looks like the children learned so much in such a short period of time and had a great springboard for further investigations. I am inspired to try to transform our very “concrete” and manicured outdoor space into something more natural with a lot more learning opportunities! I think that his might be a challenge for many teachers dealing with a new kindergarten class where the outdoor space is not ‘green’ as it should be. Any suggestions on ways of transforming a concrete jungle into a natural space, on a budget, would be great! Thank you for stopping by my blog and taking the time to comment! I totally understand what it is like to have limited space and resources in the outdoor environment. When we started the full day we had a nice enclosed space for our students but it had been rather neglected for some time and was a blank canvas for us to develop. The first thing I would do is think critically about what kinds of opportunities you want your students to have outside. For us, it was important that the outdoor space mimic the centres we have inside, with an additional focus on nature and the environment. The next step was to gather some inspirations for what we could do to make our goals happen. 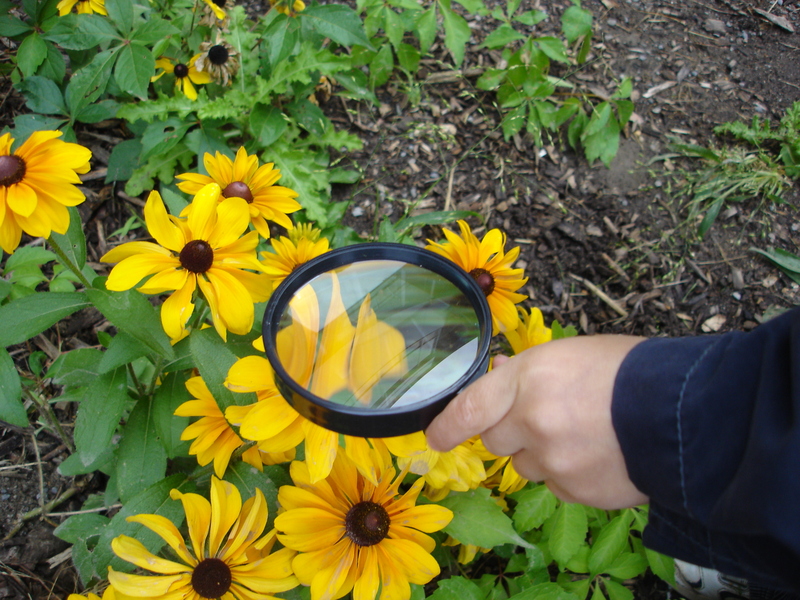 There are are so many amazing blogs about outdoor learning! Also, I would highly recommend looking at Pinterest for inspiration. There are many teachers out there who have lovely boards about “outdoor classroom” learning. We got many good ideas from there! Most of what we added to our space was free – giant tree stumps we picked up from the side of the road to add seating/tables to our space, leftover wooden boards for our outdoor construction area, plastic cones and pipes from ArtsJunktion (a school board sponsored recycling warehouse). 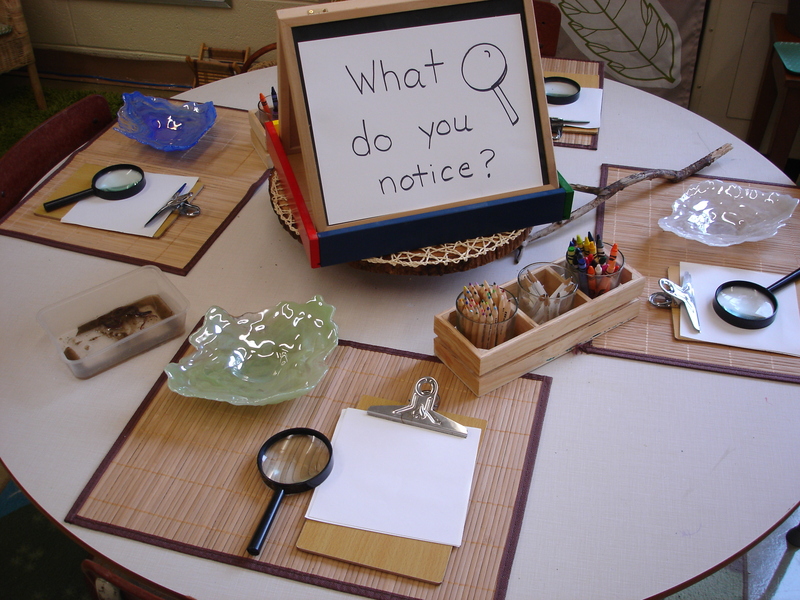 We often bring out materials from our classroom too – like painting paper and paints, chalk, and magnifying glasses. In the Spring when we didn’t have any flowers to plant we spent a little bit of money on fake flowers, got free planter pots from the nursery, and had an instant flower shop pop up! We leave bowls and spoons outside to catch the rain, which the children use in our mud kitchen to make all kinds of concoctions. Mirrors from the dollar store can be used to gaze up at the clouds in the sky, and you can use all kinds of materials to study shadows. Good luck developing your space! A blank canvas can sometimes be the best place to start! I’m currently working on ideas for outdoor math lessons for grades K-1. I came across your lesson and would love to include this activity. I’m reaching out to ask your permission for me to summarize the lesson and quote from your blog post. I’m on a tight deadline and, as such, would appreciate your response by Friday, March 10. Feel free to email me at the email included. Would you like for me to include your blog’s name (and link to it in the online version of the article)?